I am an evolutionary biologist and wildlife conservationist affiliated with the Durrell Institute of Conservation and Ecology (DICE) at the University of Kent. I completed my PhD on the evolutionary history, ancestral origins and population genetics of invasive ring-necked parakeets. 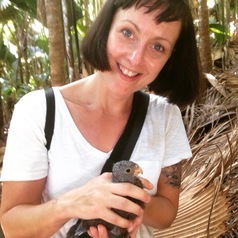 I previously worked as a postdoctoral research assistant for the Seychelles Islands Foundation to determine the evolutionary distinctiveness of the Seychelles black parrot. My research interests centre around evolutionary conservation genetics, phylogenetics and biogeography in both invasive and endemic species. I use molecular DNA techniques to understand fundamental eco-evolutionary questions in invasion biology and species conservation. My research includes evolutionary phylogenetics and biogeography of globally invasive species across large continental systems, such as the ring-necked parakeet. I am also interested in the population genetics of small, endemic island species, in particular those in the Indian Ocean islands. I have studied the endangered Seychelles black parrot and Aldabran fody. I have also worked with a number of extinct parrots, successfully extracting DNA to resolve their taxonomic affinities.